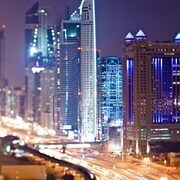 Learn about Sheikh Zayed Road? Wife and I celebrated her 50th birthday in Dubai at this amazing hotel and had an amazing time. The room at 525sqft is the same size as a one-bedroom apartment in New York City and very clean. We really enjoyed the breakfast and the staff are fantastic. Michelle, Kim and Anand the manager, were real professionals, very welcoming and made time to talk to every one, always so friendly Kim our server was very attentive, we really appreciated the kind service rendered. The hotel has a roof top terrace and pool which looks out at the skyline which is great when you have spent all day exploring and come back to relax. 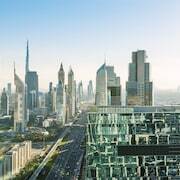 The location of the hotel is perfect in my opinion as you’re just a walking distant to the mall, to the downtown and to the Burj Khalifa. if you do need to venture to the beach the hotel provide free ride. Our shuttle Driver to and from Kite beach is Mr. Wilson, a very good guy!!! Very knowledgeable giving us lots of information about Dubai and very accommodating, he gave us towels and water for our stay on the beach. 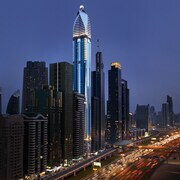 This will not be the last time we stay at this hotel it will always will be our first choice when going back to Dubai. 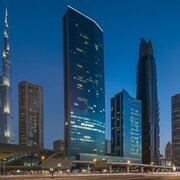 Travellers to Sheikh Zayed Road give high marks for the shopping, abundant cafes and top-notch restaurants. This scenic city also attracts tourists with its tours and museums. 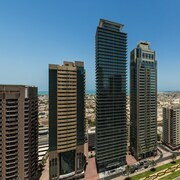 Top sights around the area include Burj Khalifa, Mall of the Emirates and Ski Dubai. You can access metro transport at Noor Bank Station, Business Bay Station and First Gulf Bank Station. If you'd like to explore around the area, consider renting a car to take in more sights.